Grammar Gang: A cup of coffee or: I'll have a super supremo grande please! A cup of coffee or: I'll have a super supremo grande please! Have you ever noticed how confusing the names of coffee cup sizes are? Long gone is the logical small medium or large - there is a whole new world of coffee sizes out there. Starbucks is calling its coffee cups: ''Tall'' (meaning ''not tall,'' or ''small''), ''Grande'' (meaning ''medium'') and ''Venti'' (meaning, just guessing here "smallish'). One of our own possums Andrea has just ordered a "medium" coffee and received a "large" while she actually inspired one coffee shop to call its largest size ''jumbo'' because they were constantly giving her a medium coffee instead of the tallest one which is what she thought she was ordering. But I think that Brady's comment takes the prize. He writes: As per the ordering size chaos that is infecting every shop in the US ... if you ever happen to visit a Coldstone Creamery (fancy ice cream shop), the sizes are "Like It / Love It / Gotta Have It." I just say "small please." Our most trendy coffee shop chain here in Australia, Cibo, call their coffee "small", "grande" and "alto" and look at you sideways if you try to order anything else! Share your coffee cup size confusion! Why is this happening? A small correction, Susanna. Cibo calls the coffee (in order of size) 'Cafe'; 'Alto' and 'Grande'. Even if you say 'I'll have a small coffee', they say back to you 'one Cafe, then?'. I would guess it is happening because the shops make more money with larger drinks. Suppose they sell you 12 ounces instead of six, but still call it small. You're getting way more than you want (or can drink). They still get the extra cash they want. My two cents. Everybody has to be cute. Cute sets you apart. Cute, whether right or wrong, provides someone material for a blog post. So few people and businesses name things in a normal way. Look at the pharmaceutical industry; it is always making up words for its drugs. Consider how parents name their children; you have to ask everybody to "please spell that." It is, quite honestly, ridiculous! 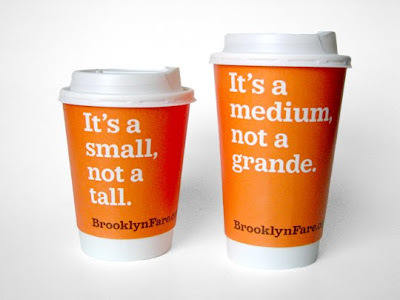 I'd like to think that more folks who visit this site know this but the famous coffee company that seems to confuse the general population with its sizes isn't necessarily to blame. And the general population need not be so confused. They began with two sizes--short and tall (10 and 12 ounces, respectively)--but as the insatiable appetite for coffee grew, so did their sizes. So where do you go if you want to add a larger size to short and tall? Grande. 16 ounces. Then when 16 ounces of caffeine and deliciousness just isn't enough? Well, we have a bit of a problem. Sure, they went with the Italian for 20, but really, should that REALLY be that unknown or confusing to folks? If it is, what's the harm in asking when you don't understand something? You might find that people are NOT aiming to confuse you after all! As a former Starbucks employee, just thought I'd add another element to the confusion - they have (or at least used to have) a "small" size, which was really a mini--a kind of half-cup--and so they named the size most people would identify as a normal small as "tall" to distinguish it from their mini cup. Or at least that was the explanation I received when I asked why on earth a small cup was called a tall. We could also get in trouble if we didn't repeat an order in Starbucks lingo (i.e. a customer would order a small latte with skim milk, and we had to say "one tall skinny latte, coming up")--so don't get mad at your baristas when they do that--they may just be trying to avoid managerial reprimands! I had a Grande at Cibo last week but I thought that I ordered a medium. Ooddy - I'm glad we have managed to clarify the sizings of Cibo coffee cups for you.